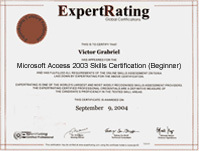 (leading to ExpertRating Microsoft Access 2003 Skills Certification-Beginner). Learn how to use Microsoft's powerful and award-winning database to store, locate, and print just about any type of important information. In this six-week online workshop, you'll learn how to create tables, relationships, custom data entry forms, queries, reports, mailing labels, and macros. You'll also learn how to merge the data in your Access tables with Microsoft Word form letters. About the ExpertRating Online Microsoft Access Course (2003- Introduction) instructor : Craig Power has worked in adult continuing education for more than 18 years. A UCLA graduate, he created custom accounting software for state and local governments; developed an online course delivery and marketing platform currently used by more than 1,500 colleges and universities in the US, Canada, and Australia; developed an interactive cellular biology video for the Los Angeles Unified School District; taught college-level information technology courses; started and grew a thriving small business; and served as an executive with a large academic publishing corporation. Introduction to Microsoft Access 2003 Skills Course requirements: For taking this instructor led ExpertRating Online Microsoft Access Course (2003- Introduction) you need Microsoft Windows XP or 2000, Microsoft Access 2003 or Microsoft Office Professional Edition 2003 (please be sure to install this software on your computer before the course begins), Internet access, e-mail, and the Microsoft Internet Explorer or Mozilla Firefox Web browser. Note: Microsoft Word 2003 or Microsoft Office Professional Edition 2003 will also be required for Lesson 12. This course is not suitable for Macintosh users, nor for users of any of the 2007 versions of Microsoft Access. "I loved the course! I feel that I now understand the basics of Access, which is what I wanted to get out of the course." "This was my first online course and other than life getting in the way I enjoyed this format very much. It was so nice to not have to attend class, but instead do it at my own pace when it was convenient for me. Thank you for offering this." "A terrific course--I liked the presentation." "This is the fourth ed2go course I have completed. It is by far the best one yet." "I found the material easy to follow and thought the content contained pertinent information to begin working with Access databases. In the discussion area, I was able to find a resolution to an issue I ran across. I plan to continue taking more advanced classes as time permits. Thank you for the opportunity to make my job easier!" "Liked the class. Tried to take Access [elsewhere] and felt lost. This time I actually understood it. The discussion area helped me when I was puzzled. Thanks too for your sense of humor - it helped!" ExpertRating is one of the world's only ISO 9001:2015 Certified companies (from TUV America) offering an Online Microsoft Access (2003- Introduction) Course (leading to ExpertRating Microsoft Access (2003- Introduction) Skills Certification). When you choose the ExpertRating Online Microsoft Access Course (2003- Introduction) you can be sure that you are buying a premium International certification that is recognized by hundreds of employers and Government bodies in the US and other countries. With ExpertRating you get certified quickly online and you are equipped with a store house of information through the in-depth ExpertRating Online Microsoft Access Course (2003- Introduction)ware which has been developed by experienced Computer Applications Experts. The ExpertRating Microsoft Access 2003 Skills Certification-Beginner is by far the best value for money instructor led Microsoft Access 2003 Skills Certification-Beginner Program at $129.99. How much does the Microsoft Access 2003 Skills Certification-Beginner cost and what does it include? You can buy this ExpertRating Online Microsoft Access Course (2003- Introduction) leading to Microsoft Access 2003 Skills Certification-Beginner at a special offer price of only $129.99 which includes the in-depth ExpertRating Online Microsoft Access Course (2003- Introduction)ware and exam fee. This is the best value for money Microsoft Access 2003 Skills Program available till date. 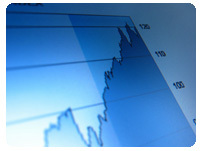 You get the following services within the USD $129.99 fee. In-depth ExpertRating Online Microsoft Access Course (2003- Introduction)ware including scenarios and examples. World wide airmail delivery of the hard copy Microsoft Access 2003 Skills Certificate. The Microsoft Access 2003 Skills certificate can be used to prove your certified status and does not mention the words "online". 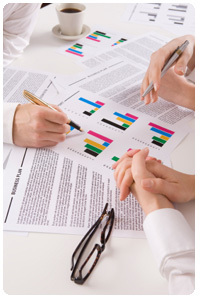 The process of getting yourself certified is very simple. All you have to do is buy the ExpertRating Online Microsoft Access Course (2003- Introduction) for $129.99. Log in to the instructor led course using your password. Go through the ExpertRating Online Microsoft Access Course (2003- Introduction)ware (which would take you 6 weeks) and complete the final Microsoft Access 2003 Skills Certification-Beginner exam at your convenience. You can complete the exam within 2 months of buying the Microsoft Access 2003 Skills Certification-Beginner. The result of the exam appears as soon as it is completed, and your Microsoft Access 2003 Skills certificate is mailed immediately. Chapter assignments to help you practically use the Microsoft Access 2003 skills that you will learn during the Microsoft Access 2003 Skills Course. The final exam is fully based upon the ExpertRating Online Microsoft Access Course (2003- Introduction)ware that is provided along with the Microsoft Access 2003 Skills Certification-Beginner. If you have gone through the courseware properly you should not have a problem clearing the exam. The exam consists of multiple choice questions from all chapters of the ExpertRating Online Microsoft Access Course (2003- Introduction)ware. According to the U.S. Bureau of Labor Statistics (BLS), most employers value prospective candidates who possess formal education in Microsoft Access.